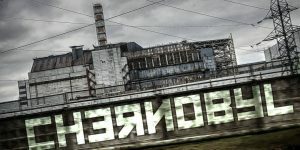 Alternately, Ukraine’s Minister of Health Andrei Serkyuk estimated in 1995 that 125,000 people had already died from the direct effects of Chernobyl’s radiation. Serkyuk said a disproportionate share of casualties were among children, pregnant women and rescue workers or “liquidators.” Liquidators were soldiers ordered to participate in the removal and burial of radioactive topsoil, heavy equipment, trees, and debris, wearing no protective clothing, respirators or radiation monitors. Thirty-six hundred deaths, or 125,000? Nine million people affected, or 50 million? The health effects of exposing everyone in the hemisphere to Chernobyl’s radiation (and Windscale’s, and Santa Susana’s, and Fukushima’s) — effects that are often delayed for decades — are quite incalculable. Got cancer? 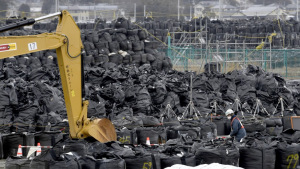 Over 19 million tons of radioactively contaminated soil have been collected in 1-ton bags and stacked in thousands of places in Japan, since the triple meltdowns of March 2011. Eleven million tons could be incinerated. KYODO photograph. Fukushima caused the worst dump of radioactivity to the Pacific Ocean in history. “This event is unprecedented in its total release of radioactive contamination into the ocean” wrote Ken Buesseler of the Woods Hole Oceanographic Institution for PBS News Hour in March 2016. Buesseler has been recording Fukushima’s Pacific Ocean contamination since it started 3/11/11. While Fukushima is often called the “2nd worst” radiation accident behind Chernobyl, Buesseler said, “More than 80% of the radioactivity from the damaged reactors ended up in the Pacific — far more than reached the ocean from Chernobyl.” Buesseler reported this radiation gusher continues. “It is incorrect to say that Fukushima is under control when levels of radioactivity in the ocean indicate ongoing leaks, caused by groundwater flowing through the site and enhanced after storms,” he wrote. The worst airborne radiation spill in 25 years: Like the Chernobyl disaster that spread radiation across the Northern Hemisphere, Forbes reported March 28, 2011 that the US EPA recorded Fukushima’s radioactive iodine-131 in rainwater in Pennsylvania and Massachusetts at levels above the max allowed in drinking water. The EPA’s air monitoring also found Fukushima’s radioactive iodine-131 in California, Colorado, Hawaii, Washington, and Nevada. Nothing close to this immense, hemisphere-wide radiation dispersal had happened since Chernobyl in 1986. Fukushima is the world’s worst reactor disaster by volume of fuel melted and waste in cooling pools. Major reactor meltdowns at Santa Susanna in California (1959), Windscale in England (1957), Three Mile Island in Pennsylvania (1979), or Chernobyl in Ukraine (1986), involved a single fuel inventory. Fukushima’s meltdowns involve three reactors’ full of melted and mangled fuel rods, and an additional 1,573 uranium fuel rods in damaged condition in damaged pools of cooling water. The three masses of melted fuel may never be recovered much less containerized. Fukushima caused the largest evacuation in the history of nuclear power: 160,000 evacuated from the zone first set at 12, and later expanded to 19 miles. (116,000 were forced to leave Chernobyl’s dead zone.) Two weeks after the start of the meltdowns, people from between 12 to 19 miles away were encouraged to “voluntarily evacuate.” The US government recommended that US citizens stay 50 miles away. The failed “ice wall” made to divert groundwater away from the reactors’ foundations — smashed and cracked by the earthquake — means that hundreds of tons of water keeps pouring every day into the wreckage of reactor chambers where it is contaminated by contact with the masses of melted uranium fuel, and either rushes out to sea or is collected for filtration in the failed Advanced Liquid Processing System (ALPS). At right, Harrison, British Columbia, where some soil and salmon were found to be contaminated with radioactivity from Fukushima last March. 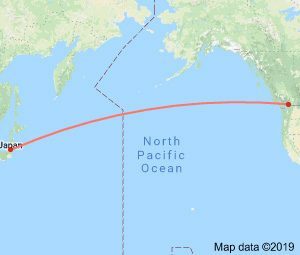 Harrison is 4,600 miles from Fukushima. The Japanese fishing community and nuclear watchdog groups are raising alarms over government plans to dump into the Pacific over 1-million tons of highly contaminated waste water from three devastated nuclear reactors at Fukushima. Greenpeace issued a report Jan. 22, 2019 condemning the plan, reminding the public that the owners/operators of Fukushima — Tokyo Electric Power Co. (TEPCO) — admitted in 2018 that its waste water treatment system (the Advanced Liquid Processing System or ALPS) had failed. “Despite the much-vaunted Advanced Liquid Processing System (ALPS) plant at Fukushima, Tepco has confirmed that levels of strontium-90 are more than 100 times above legally permitted levels in 65,000 tons of water that have already been through the ALPS system,” the South China Morning Post reported last January. Outrage within the fishing community was palpable during a series of public hearings last year which were designed to convince skeptical observers that pouring more radiation in the Pacific is a good idea. The magnitude-9 earthquake, and the tsunami it caused on March 11, 2011, left more than 27,500 people dead or missing in northeast Japan, and triggered the largest release of radioactivity to the ocean in history. Since Fukushima’s triple catastrophe — earthquake, tsunami, and radiation plumes — there has been relentless news of seafood contamination. On Feb. 2, 2019, the Japan Times reported that radioactive cesium far above the legal limit was detected in fish caught off Fukushima, according the Fukushima Prefecture’s Fishery Cooperative Association. Skate, a variety of ray, that was caught over 180 feet deep, was found with 161 Becquerels-per-kilogram of radioactive cesium-137, exceeding the allowable limit of 100. However, since cesium-137 is a reactor-borne element not found in nature, the established 100 Bq/kg limit is arbitrary. None whatsoever should be “permitted” because any internalized cesium-137 can potentially cause health problems. Any cesium that we eat and which is not excreted, adds to previously ingested radioactive materials. Radioactive water is continuing to flow into the Pacific Ocean from the site of three mangled reactors at a rate of around 2 billion Becquerels a day, according to a 2018 Japanese study, the Japan Times reported March 29, 2018. Cesium-137 has been found in Canadian fish as well. The Haida Gwaii Observer in Queen Charlotte, B.C. reported last March 16, 2018 on a press release issued by Krzysztof Starosta, a chemist at Simon Fraser University’s nuclear science lab. Starosta reported that in his study, cesium-137 “levels found in both the salmon and soil samples remained below Canada’s safety guidelines, posing minimal health risk to B.C.’s salmon and human populations.” The use of the word “minimal” by Starosta is a trivialization of “some” risk, especially when considered in view of the cumulative effect of eating contaminated fish over a lifetime. Likewise in the United States, in April 2014 the Oregon Statesman Journal reported on a study by Oregon State University that found that Fukushima radiation in albacore tuna caught off the Oregon coast tripled after the 2011 meltdown. “You can’t say there is absolutely zero risk because any radiation is assumed to carry at least some small risk,” said lead author, Delvan Neville, in OSU’s Department of Nuclear Engineering and Radiation Health Physics. In October of 2012, Albacore tuna caught off Washington and Oregon and Blue fin tuna off of California were also found contaminated with Fukushima cesium. “In late September , Tepco was forced to admit that around 80% of the water stored at the Fukushima site still contains radioactive substances above legal levels…” the Telegraph said. TEPCO has admitted for example that in several of the storage tanks, levels of deadly, long-lived strontium-90 are 20,000 times the allowable limit levels set by the government. Pouring this carcinogenic brew into the sea is reckless endangerment of the commons. There ought to be a law. 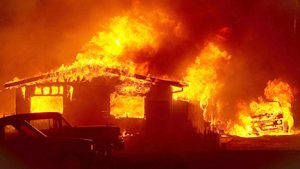 The Woolsey Fire burned some 100,000 acres south of California’s Simi Valley, including much of the severely contaminated Santa Susana Field Laboratory. Of 10 shuttered experimental reactors on site, four were damaged by meltdowns that released radioactive materials, and tons of toxic wastes were burned in open pits for decades—all just 30 miles from Los Angeles. The Woolsey Fire began on November 8 at the Santa Susana Field Laboratory (SSFL)—a heavily contaminated experimental reactor and rocket testing facility 30 miles from Los Angeles—and burned much of the site. Government assurances that the fire did not risk increased exposures to SSFL contamination have been met with distrust and skepticism, in part because the very entities claiming there was no toxic risk from the SSFL fire are the ones responsible for contaminating it in the first place and violating commitments to clean it up. In the face of broad public rejection of official reassurances by the troubled state toxics agency, community members near the SSFL will participate in an independent study of potential migration of contamination from the site following the Woolsey Fire. Fairewinds Energy Education, a non-profit organization founded by former nuclear industry scientists, will conduct the study of dust and soil samples collected from homes in the area and sent to an East Coast laboratory for analysis. Government agency reassurances lack credibility in large measure because: Within hours of the fire, with no data whatsoever, the Department of Toxic Substances Control (DTSC) issued a statement claiming there were no releases of radioactive or toxic materials. DTSC claimed in a Nov. 9 statement that no contaminated areas of SSFL had burned. Subsequent satellite photos demonstrated that a large portion of the site did burn, much of it contaminated. DTSC then tried to walk back its initial false claims. Similarly, the US Department of Energy (DOE) initially claimed the fire hadn’t touched any of Area IV inside SSFL. When satellite photos also disproved this assertion, DOE retracted it. Days after the fire at SSFL stopped, DTSC said it and others took measurements. But the primary concern was release of contamination in the smoke during the fire. DTSC reported that its measurements, taken days after the fire, found no contamination even at SSFL. However, DTSC has for decades acknowledged the site is heavily contaminated, which is why extensive cleanup has been required in formal agreements between DTSC and the polluters. The US Environmental Protection Agency conducted a $40 million, multi-year study which found 500 locations at SSFL with elevated radioactivity. Claims by DTSC that its post-fire measurements could find no contamination at SSFL even though extensive corporate pollution at the site is undisputed, suggests: (1) agency measurements are so insensitive the agency cannot detect contamination that is there; (2) DTSC is inflating background values to make additional contamination appear not to exist; and (3) it is lying about its actual results. If the measurements were somehow correct, and there is no longer any contamination at SSFL after the fire, it would mean the fire drove off existing contamination from the SSFL site and into the outlying communities. The agency’s claims of being unable to detect any contamination, even at the polluted SSFL sites, raise serious questions about the validity of DTSC’s statements. The DTSC has failed to explain how a fire can burn hundreds of acres of contaminated vegetation growing in contaminated soil and not release some of those contaminants. It is a scientific impossibility. Community members and elected officials have repeatedly asked DTSC to disclose all data and methodology to back up its implausible assurances, but four weeks after the fire no data whatsoever have been released. “DTSC says at some point it will release a summary of its conclusions, suggesting it is taking weeks to ‘massage’ the data,” said Denise Duffield, associate director of Physicians for Social Responsibility-Los Angeles. At a Nov. 15 press conference, Governor Brown said he too was “very skeptical” of assurances by his own agencies that there were no toxic releases from the fire at SSFL. Community members and health advocates say that their focus now is ensuring that SSFL is finally and fully cleaned up. “Our greatest frustration is that if DTSC had kept its word, the site would be cleaned up by now and we wouldn’t have new worries related to the fire,” Duffield said. In 2010, DTSC signed agreements with the Department of Energy and NASA that committed them to clean up all detectable contamination in their operational areas by 2017. DTSC also in 2010 committed to require Boeing Corporation, which owns most of the site, to cleanup to comparable standards. But the cleanup has not yet begun, and DTSC is currently considering proposals that could even leave all of SSFL’s contamination permanently on site. Boeing mounted a formidable greenwashing campaign against a full cleanup, and DTSC issued a Draft Environmental Impact Report (DEIR) last year indicating that much of the contamination would not be removed. Community members worry that if the DEIR is finalized, their hopes for the full, mandated cleanup will be dashed. Residents interested in participating in the study can go to http://bit.ly/SSFLstudy to sign up. To sign the petition to get Santa Susana cleaned up click here. —Physicians for Social Responsibility-Los Angeles has worked for the cleanup of SSFL for over 30 years, and Parents vs. SSFL is a grassroots group demanding full compliance with SSFL cleanup agreements as required by law. “Bowing to the nuclear industry, the Trump administration appears to be relying on fringe researchers who reject mainstream science to roll back radiation safety laws,” the Natural Resources Defense Council Reports. “Despite substantial evidence that any level of ionizing radiation poses a cancer risk, the US Environmental Protection Agency is currently pursuing a little-noticed change that could lead to weaker protections for workers at nuclear plants, medical technicians conducting X-rays, and those living near Superfund sites contaminated by radioactive material,” the NRDC said Oct. 2, 2018. The EPA’s “new proposal pulls from scientific outliers friendly to the nuclear industry who claim low-level exposure to this and other toxins could actually benefit the body. One problem: The National Academies of Science (NAS) and the EPA’s own scientists have studied this idea [known as ”hormesis”] and summarily dismissed it as bunk,” the group noted. The motive behind the EPA’s proposal was made clear by Edward Calabrese, a toxicologist at the Univ. of Massachusetts, who said in 2016, “This would have a positive effect on human health as well as save [industry] billions and billions and billions of dollars.” Ed Lyman, senior scientist with the Union of Concerned Scientists, told Courthouse News “the vast majority of scientific work” finds there is no acceptable level for radiation exposure. And if the administration uses the work of Calabrese it would be an example of choosing the outlier instead of what’s generally accepted. There is no specific date for adoption of the new rule.